When you go to vote tomorrow, be on the lookout for elusive flammable polling stations. If all politics are local, then all politics in NYC are in trouble. Yes it's a presidential election year, so local politics tend to get lost in the sturm and drang of national electioneering, but by this time tomorrow many of you will have (hopefully) already voted, and with possibly little idea of who's behind those little thumb tabs you've pulled down. By now you've likely seen the Leo and famous friends Don't Vote video that directs you to a Google Maps polling place finder. The site hosted by the board of elections also does a pretty good job of this, but you won't get the neat targeted ads. The League of Women of Voters also come through on this score. So that's enough to get you there, but what about mistakenly voting for a dope fiend or a Republican in Democrat's clothing. Remember what GI Joe always said about knowing being half he battle? If you only watched the nightly news and read a couple of newspapers every day, you'd be forgiven for thinking that when you got into the voting booth tomorrow there was just going to be one big box on the right reading "McCain/ Palin" and one on the left reading "Obama/Biden." Of course that's not the case. You'll need to do a bit of digging though. To view a sample ballot just go to Vote-NY and enter your address to pull up a sample ballot for your district. If the candidates bothering giving the board of elections or Vote-USA any information, you can find it on the site. Another good source of information on local elections is Vote-Smart. There are also news sources like the Gotham Gazette, that do a pretty good job of delivering local issues. 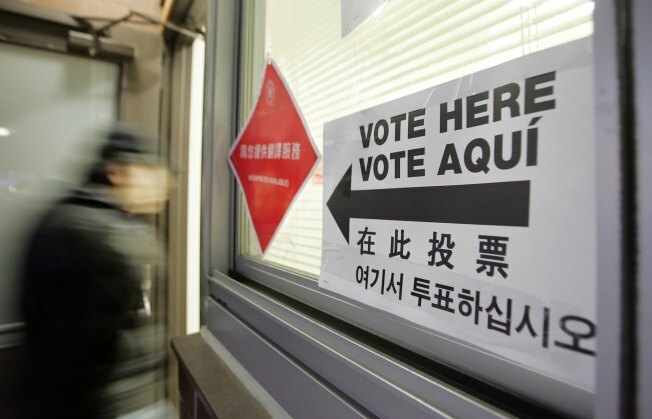 Its continually updated last minute voter guide runs through the issues and developments. But even they have limits. Take the coverage of the New York State Senate race in district 32 (which covers approximately TriBeCa to Lincoln Center on the west side and a chunk of the East Village). Under the headline "Duane Faces Little Known Challenger" there are two paragraphs on the incumbent Sen. Tom Duane (D) and just this about his challenger: "Little information is available about Leible." They may have a point though; a Google search on the candidate pretty much reveals only a few listings of campaign contributions she's made over the years. It also reveals that she is an executive assistant at global investment management firm Alliance Bernstein, so she might be a little preoccupied right now. Polls are open from 6 AM to 9 PM throughout the city tomorrow, so get some shut eye, grab a coffee, and, like the man says: Vote early and vote often. Or, maybe, just early.